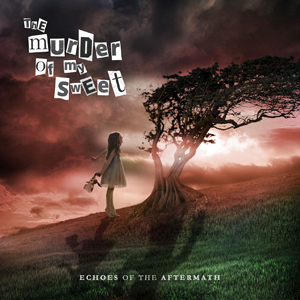 THE MURDER OF MY SWEET will release their fourth studio album, Echoes Of The Aftermath, on January 27th, 2017 via Frontiers Music Srl. 2015 saw THE MURDER OF MY SWEET reunite with their original label home, Frontiers for the release of their concept album Beth Out Of Hell, a magnificent album that was described as “[a]lmost Wagnerian in style” (Sonic Cathedral) and favorably compared to such masterpieces as QUEENSRYCHE's Operation: Mindcrime by the UK's Powerplay Rock and Metal Magazine. The new album Echoes Of The Aftermath musically follows on the heels of the previous record, with a more straight ahead songwriting approach, but still offering the symphonic and cinematic elements the band is now well known for. Echoes Of The Aftermath showcases a Nordic sound that the members of the band grew up listening to and lyrically takes on issues in tune with our modern day life. Singer Angelica Rylin adds: "For me, the writing process for this album became a way to reconnect with my Nordic roots. I’ve always been a fan of John Bauer (Swedish painter and illustrator) and his portraits of Swedish folklore and fairy tales was a big inspiration for me. And it was a nice break from "Beth", who had become such a big part of my life for a very long time." Tour dates are planned in support of the album. Be sure to catch THE MURDER OF MY SWEET when they play in a town near you!